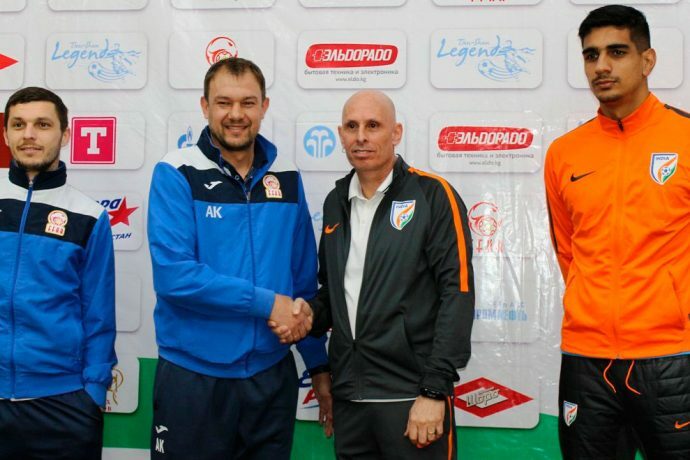 A day prior to India’s last group league match against the Kyrgyz Republic in Bishkek, National Coach Stephen Constantine has said that “regardless of our qualification, we’ll push for a win.” Constantine was speaking at the official pre-match press conference on Monday (March 26, 2018). “We haven’t come here to lose,” he stressed. “Our objective was to qualify for the AFC Asian Cup UAE 2019 and we have achieved our aim. From now on, it’s part of our preparation for the Asian Cup to be held next year,” he added. The kick-off on Tuesday (March 27, 2018) is slated for IST 7.30pm. India are currently at the pole position in Group A with 13 points from 5 matches so far. The last time the two teams met in Bengaluru, Sunil Chhetri’s sublime strike made the difference between the two teams. Constantine also dismissed the speculations that the cold weather in Bishkek may play a crucial role. “The weather is not playing any crucial part,” he clarified. “Kyrgyz Republic are a very strong side. They recently won against Myanmar and have also qualified for the Asian Cup. We respect them as an opponent. We want to win and as coach said, the match is a part of our preparation towards the AFC Asian Cup next year,” he mentioned. “I always play to win and never to lose. When you represent the National Team you are never playing for a draw. The result might be a draw but we won’t play for a draw,” he quipped. Gurpreet highlighted the importance of a solid back four which lays the bedrock for the success of any team. “Not only us, every team needs a solid back line. We have conceded few and have been able to put pressure on our opponents. The plan worked for us. We’ll look forward continuing doing that,” he said.